The latest round of America’s Cup Class practice racing ahead of the 35th America’s Cup concluded on a beautiful spring Sunday on the Great Sound. 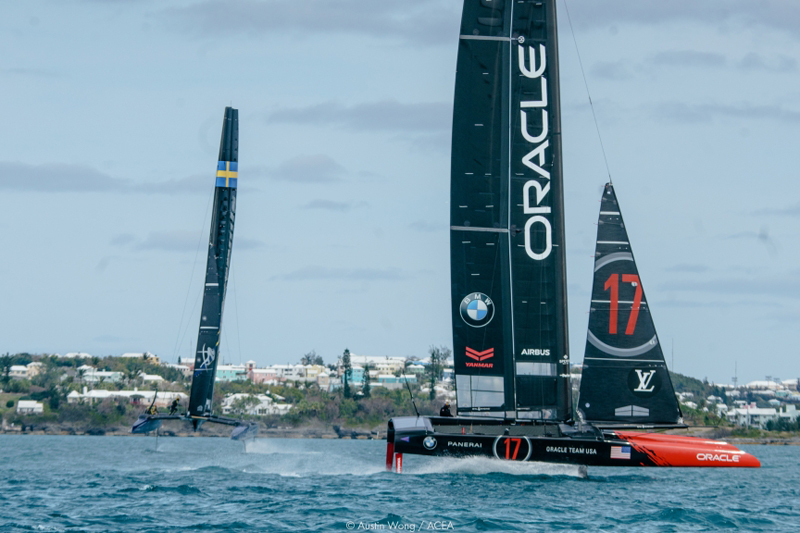 All five America’s Cup teams now based in Bermuda took part in a series of match races in varied conditions, racing each other on a course that closely mirrors that to be used in May and June 2017 when the 35th America’s Cup itself will take place. The practice racing results show just how close the teams are, and how tight the margins can be on the water. Oracle Team USA, winners of nine of the 11 races the team took part in, even collected one of the on-water marks on their starboard bow during one race, Skipper Jimmy Spithill later posting an image on his Instagram account of ’17’, the team’s ACC boat, in action with a bright yellow, now deflated, mark adorning the tip of the starboard hull. Summing up the practice racing overall, Oracle Team USA Skipper Jimmy Spithill said “I think the racing this summer is going to be incredible. Over this session, we’ve seen every team win at least one race, which is an indication of good match ups. “All the teams that are here have taken big steps since the last time we raced in the AC45 Turbo boats. This is the first time we’ve lined up in the new boats and some of the match-ups were really close. The crew work we’ve seen has been pretty impressive across the board. The level keeps going up. Another team who will be happy with their weekend’s action are Artemis Racing, winners of seven of their ten races. Skipper Nathan Outteridge and Team Manager / Tactician Iain Percy gave their feedback, saying “We’re still getting used to sailing the boat, and the windy and wavy conditions on Friday led to a tough start, losing our first two races. But it was good to finish off the day with a win against Jimmy, just on the line. SoftBank Team Japan took part in four races, winning two and losing two, while Groupama Team France, the latest team to arrive in Bermuda, raced seven and won one. Finally, Land Rover BAR took part in ten races over the last few days, winning two and losing eight.